Did you ever wish you could turn back the clock on your Inventor model? For Vault users or any other document management system that supports Inventor, retrieving an older version of your model is straight forward. However, not everybody uses a document management system to manage their Inventor model and may not realize you can still accomplish this through your project file settings. Even if you do have a document management system, this Inventor project setting still may have use for you. First edit your project file and scroll down until you see the Options section. Expand it and the first option listed under this section deals with the number of versions to keep when you save your Inventor file. By default, all project files are set to a value of 1. To change this value, right mouse click on the option and select Edit. Enter a number (i.e. -1, 0, 1, 2, 3, 4, 5, etc.) representing the total number of backups you want to maintain in your project workspace. If you enter a value of negative 1 (-1), Inventor will maintain the entire history of your model. Though it is not recommended, you can also enter a value of zero (0) to create no backups of your files for this given project. These backups are stored in a sub-folder located under your project workspace called “OldVersions”. The files are automatically named <Inventor file name>.<version #>.<Inventor file type> when you perform an Inventor save. These versions are only created when the user makes a physical change to the model and saves it. If a save is applied to a model with no changes, no new version is created within this folder. What about items in my assembly that are not located in my project workspace, how are they maintained? If you have the ability to edit these components, their versions are also maintained in a sub-folder called “OldVersions” where the Inventor component resides. Versions related to files outside of your project workspace are controlled by the user’s active project settings. If a component is being shared in multiple projects and can be edited by numerous individuals, its version history may be impacted due to the different user’s project settings that are controlling it. How are the versions maintained? Let’s say your setting for “old versions to keep” in your project file is set to five (5). When you reach backup version #0005, the next modification along with an Inventor save will remove Version #0001 from the backup folder and replace it with Version #0006. The next modification to the file along with a save, would replace Version #0002 with Version #0007 and so on. So how do you use these versions? When dealing with Inventor parts, the process is very simple. Using Windows Explorer or any other file management tool, rename the original Inventor part in your project workspace to another name. I like to add the word “old” to the file name (i.e. 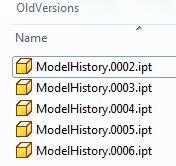 ModelHistoryOld.ipt) because its easier to find the file later on. Next locate the version you want to use and copy it from the OldVersions sub-folder into your project workspace. Rename the file by removing the <dot><version number> (i.e. .0004) from the file name. 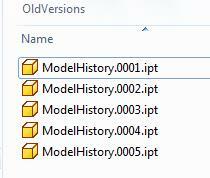 Open the (renamed history) file in Inventor, and presto you have rolled back your model. For Inventor assemblies, the steps listed above still function the same way when rolling back an assembly. However it does require additional work on your part in determining which assembly version belongs to which part. In certain cases you may not be able to fully roll back the entire history of your assembly. However with some work and a little patience, you should be able get close enough in order to save time in recreating that given version. Are there other uses besides maintaining the model history? Use this project setting to give you extra backups in case something happens to your model. Whether you use a document management system or not, I personally have saved time by accessing these extra backups when something has happened to my model. In one instance, I was able to save approximately 3 hours in restoring an Inventor part file due to a power failure. Even though I had Vault, I was still working on the part and up to the power failure I had not checked the file back into Vault. Mark Lancaster is the newest member to our Synergis technical team, having just joined us back in August. His most previous experience is as the CAD Design Manager of Pall Corporation, one of our long time customers. In that position he was responsible for workstation optimization and design management, established uniform standards for the local and global offices, and developed global systems to control and manage their design data. Have a question for Mark or any of our technical staff? Contact us and we will get back to you quickly.